Hey! Track my car, Amigo! With the average price of the cars we drive being around one million baht, a tracking device could be a godsend. Despite all the smart anti-theft devices the manufacturers put into your vehicle, the thieves just get smarter! Remember the movie “Gone in 60 seconds” with Nicolas Cage and the Shelby Mustang called “Eleanor”? That’s about how long it takes for a professional thief to steal your pride and joy. Sure, you can report the theft to the police who will assiduously search the whole of Thailand, plus Cambodia, Laos and Burma for several minutes. You should get your car back some time in the next lifetime around three in the afternoon! Imagine the chances of successful recovery if you could go to the police, report the theft and tell the friendly man in brown that it is parked 100 meters south from Big C! The policeman’s job is more than somewhat easier, and you will get your car back. All this is now possible and is available here called the Tramigo. This tracking device is apparently the best selling tracker in the world, and is exceptionally easy to use. If you want to know where your car is, then you just ring the tracker with your mobile phone - and any old mobile will do - you don’t need a fancy 3G or iPod. Now we have all heard of GPS positioning which gives a location in coordinates, which means that you need a set of surveyor’s maps to then convert the magic numbers into something you (and the policeman) can understand, but the Tramigo unit not only gives coordinates, but relates position to local landmarks, for example, 0.7 km south from Carrefour. 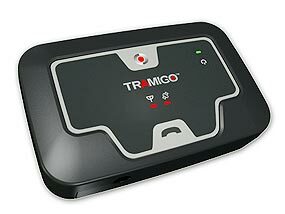 There are many other features which the Tramigo can carry out, such as letting you know if your driver exceeds the speed limits you set for him, a panic button in case of being hijacked and you can use the unit to send a mayday SMS to a preprogrammed number or you can even listen to your children with the Nanny mike accessory. Last week I mentioned that aerodynamics has become very important in today’s racing cars. I asked in what year did the first aerodynamic racer compete? The clue: “twins”. It was the Stanley Steamer of 1906, built by the twins F.E and F.O. Stanley, with a body designed to be aerodynamically more efficient than cars had been up to that time. It was driven by Fred Marriot and set the official Land Speed Record at 127 mph (203 km/h). So to this week. An easy one - where were the window winders situated on the Mercedes-Benz 300 SL Gullwing? In the Autotrivia Quiz last week I had asked about an aerodynamic racer which set records in 1906 and it was the Stanley Steamer driven by Fred Marriott who left the figure at 203 km/h. Amazingly, that record still stands today, but a British team has gone to America to try and grab the 100 year old record. However, breaking the record set by the Stanley Brothers’ steam car is proving to be difficult. After numerous technical problems, the British Steam Car team successfully carried out its first test run on US soil last week. The team has been working tirelessly to get the car ready for the record attempts to break the century-old world land speed record for steam-powered vehicles. The log from the challenger reads, “The team was in position by 7 a.m. ready for their first run. Test Driver Don Wales was strapped into the 25 ft long car that he has nicknamed ‘the lean, green, mean machine’ - because of the technical issues the team has had to overcome. The goal was to replicate the test program that took place in April at Thorney Island in the UK. 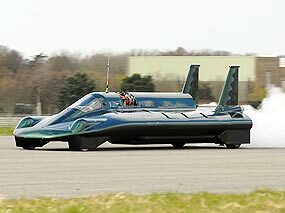 The British Steam Car Team hopes to achieve the official FIA Land Speed Record for a steam-powered vehicle. 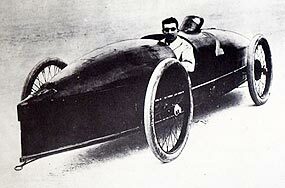 The current official FIA record was set by American, Fred Marriott, driving a Stanley steam car in 1906. I was rather chuffed the other day when David, one of the English ex-pats dropped off some old books for me. 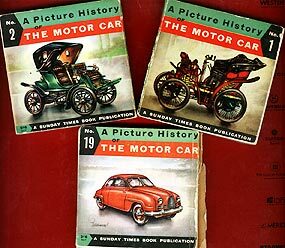 These were small pocket books which were printed by the Sunday Times in the UK in 1961, in a series of 20 books covering the motor car from Cugnot’s steam tractor of 1770 through to 1957. Each book cost two shillings and six pence! The concept was good, and the information, though not extensive, still very interesting and informative. For example, the first enclosed car was a Renault built in 1899 and had a single cylinder De Dion Bouton engine with a maximum rev limit of 1,500 RPM. Or how about the Invicta 4.5 liter Low Chassis Black Prince of 1930? This was the car whose owners manual suggested the ordinary driver take off in top gear as there was too much torque for him to handle in the lower rations! David brought me books 1-7 plus 19. Anybody got the others lying around somewhere? In a move that can only assist in resuscitating the Formula 1 series, Ferrari have asked Michael Schumacher to drive again for the Scuderia. With Felipe Massa likely to be out for the rest of the season, there was much conjecture as to who would fill the vacant seat for the rest of the season’s seven Grands Prix. It had been expected that neither of the two test drivers (Badoer and Gene) would be invited and many names were being put forward, including Kubica (now that BMW have announced their withdrawal at the end of the year) or even Alonso to jump ship from Renault mid-year. However, it was Niki Lauda (an ex-Ferrari driver himself) who suggested that the only driver up to the job was Michael Schumacher. Hamilton is totally correct where he says the whole world will be watching, but in some ways it is an enormous task that Schumacher has taken on. He has not raced for two and a half years, so has to be rusty, as well as in questionable fitness for F1. In many ways this could be seen as a lose-lose situation for Schumacher but knowing the type of man he is, he will indeed rise to the challenge and acquit himself very well. 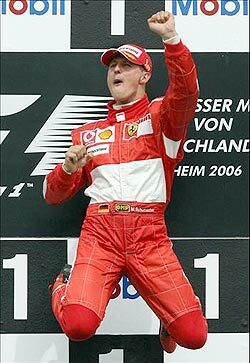 Will we see the famous Schumacher leap once more?